The torque wrench is one of those tools that you don’t want to wait to buy until you need it. If you’re working on a project that needs to get done, and realize you need to torque a bolt down to spec, you’ll be scrambling around town, trying to find a suitable wrench to buy (at higher than online cost we might add). If, on the other hand, you take your time, do your homework, and buy it before you need it, you’ll be able to order a far better tool, at a better price. The Capri Tools 31000 Torque Wrench is a very impressive tool at a very impressive price. Proving that top-quality doesn’t have to come with a premium price tag, this little torque wrench will surprise even the most seasoned mechanic. 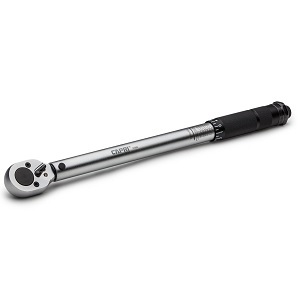 The Capri 31000 torque wrench comes in 3/8” drive and measures 15.5” in length. The torque range for this model is 10-80 ft./lbs, or 13.6-108.5 NM for metric users. The torque setting is adjustable in 0.5 ft.lb increments. Once the desired torque setting has been reached, an audible click can be heard. Precision design and manufacturing allows the wrench to be calibrated to +/- 4% accuracy. Capri includes a certificate of calibration with every torque wrench. The Capri 31000 can be used accurately in both left and right hand thread applications. The build quality of the Capri Tools 31000 is very impressive. This isn’t the lightweight, low quality junk from the auto parts store. The finish on the product is nice, including the easy to read measurements engraved in the tool. Knurled handles are usually reserved for the tools in much higher price groups, which is why we were shocked to see such a feature on a tool in the price range. Normally, a cheap rubber handle would be in place, but the knurled handle provides much better grip and is a welcomed feature on this tool. Precision is the name of the game when it comes to torque wrenches, and Capri knows this. The 31000 torque wrench is certified to ASME B107.300-2010 and ISO 6789:2003 standards and comes backed by a 1 year warranty. For our money, we will buy the Capri 31000 torque wrench every time. In fact, this is the torque wrench we recommend if you need something in the 10-80 ft./lb range. The features on this wrench are just too good to justify spending more money on a torque wrench. In our use, the Capri has not let us down a single time, and shows no signs of doing so in the future. As with any torque wrench, it is important to have the calibration checked from time to time, and Capri recommends doing so every year or so. Overall, The Capri Tools 31000 Torque Wrench has impressed and amazed us. It has the features of the high end brands, with the price tag of the discount brands. Somehow, Capri managed to not cut corners in production and they have built a real winner here. As usual, Amazon.com typically has the best price shipped on the Capri torque wrench. Overall, we think you’ll be impressed with the Capri Tools torque wrench however if you are looking for a wrench with a different torque wrench, check out other options in our guide to choosing the best torque wrench. Happy wrenching! For more pictures, to read more reviews, and check current prices, click here.